Which was NOT a reason he thinks people crave fame? Modern historians stopped using the word great when referring to people because one man's great is another man's ________. omg... scoodleypooping, puns AND a toilet reference?? What incredible feat did he accomplish at the age of 13? Which of these was not listed as something Alexander was famous for? What is the first reason/theory as to why Alexander is considered great? Besides the absence of women, what is another flaw given in the theory that greatness is equated with the deeds of great men? Historians argue whether his success on the battlefield was due to his strategic brilliance or his advanced ___________. For someone who's supposed to be great, why isn't Alexander seen as a good empire builder? After his death, his empire broke into 3 parts, collectively called the _________. Which was not one of the empires left after his death? The second theory for Alexander's greatness was his ________. The Egyptian city of Alexandria was home to _______. Which of these was NOT an effect of Alexander spreading Greek as the common language? 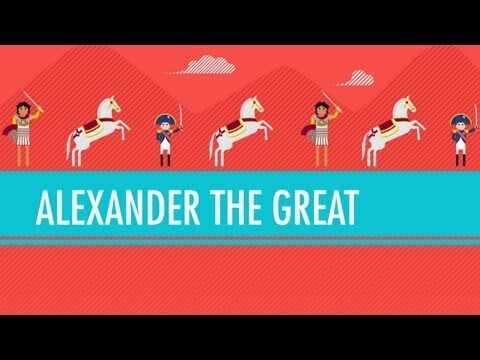 The third definition of or theory regarding Alexander's greatness is _______. Why were embellishments about Alexander (like his tutoring by Aristotle and his persistent pursuit of the Persian King Darius) so easy? Why do people exaggerate rumors of how famous people die (as Plutarch did about Alexander's death)? Why did Napoleon invade Egypt in the 1700's AD? So, millennia after his death, people like Napoleon and Pompey _________ Alexander was great. They chose to admire and emulate him. Which of these is NOT something John mentions as a problem with our obsession with greatness? Ultimately, we decide what to __________, what to care about and what to pay attention to. John's statement, 'Alexander couldn't make history in a vacuum... and neither can anyone else.' is a way of stating that the title in question (great) can't happen without any connection to other people or events. It is influenced by culture and society. So by that reasoning then, which of these is the true definition of or reason for greatness?